Burton Hall, Palatine, County Carlow, c.2006. 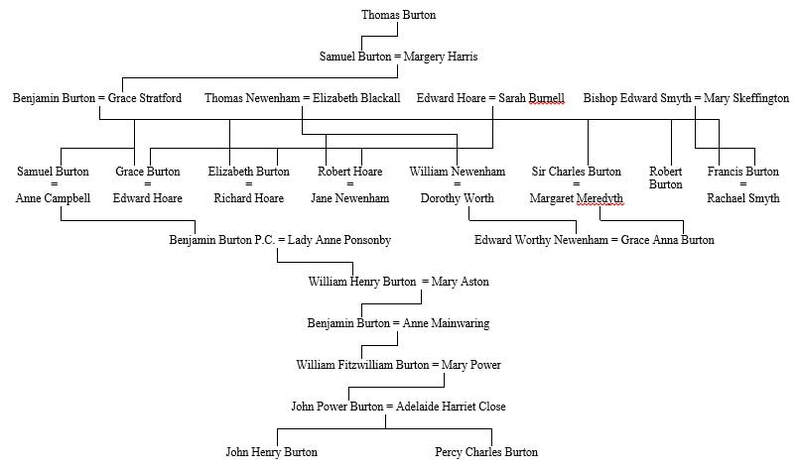 It is generally recognised that the Burton family of Ireland has a claim to roots in mediaeval England going back until at least the 15th Century. Thomas was born in Shropshire, England, in 1690. His grandson, Benjamin, an eminent banker, and Lord Mayor of Dublin in 1706, who represented Dublin in Parliament from 1703 to 1723, bought the ancestral family home, near Palatine in County Carlow in 1712 during the reign of Queen Ann, and named it Burton Hall – it was just inside County Carlow being only about a quarter of a mile south of the County Kildare border and four miles east of the county town. The family also owned Pollacton House nearer to Carlow town. Burton Hall was demolished in 1930 while Pollacton House, which had been built in 1750 and remodelled in 1803 by Sir Charles Burton, the 3rd Baronet, was demolished in 1970. Benjamin married Grace Stratford in 1686 and had at least twelve children, three of whom entered Parliament - Robert was M. P. for Carlow in 1727, 1760 and 1761. Charles was the High Sheriff of County Carlow in 1724, Sheriff of Dublin from 1733 to 1734, Alderman of Dublin in 1748 and M.P. for Dublin from 1749 to 1760. He was invested as a Knight in 1750 and Lord Mayor of Dublin from 1752 to 1753. In 1758 he became the first Baronet of Pollerton, County Carlow, and in 1760 the President of the Court of Conscience, Dublin. He had married Margaret Meredyth in 1731- their daughter, Grace Anna, married the politician, Sir Edward Worth Newenham, in 1754. Dying in 1775, Charles gave £200 to “Dame Grace Newenham to buy her mourning”. Sir Charles Burton’s great grandson, Charles Burton Newenham, lived in Stillorgan from 1832 to 1837. In 1738 Francis, married Rachael Smyth, the daughter of Rt. Rev. Edward Smyth, Bishop of Down and Connor. Dr. Smyth, sometime dean of St Patrick’s Cathedral, had been appointed vice-chancellor of Trinity in 1697 and was consecrated bishop in 1699. Samuel who married firstly, Anne Campbell, daughter of Charles Campbell of Dublin, in June 1708 was M.P. for the Borough of Sligo in 1713. They had three sons and a daughter, Katherine, who married Nicholas, 5th Viscount Netterville in February 1731. Anne had died in October 1714 when she fell from a scaffold near Westminster Abbey during the coronation of King George I. Samuel was M.P. for Sligo 1713, and for County Dublin in 1727 - Burton Hall in Stillorgan was built for him in 1731, presumably to enable him to be closer to Dublin. Samuel and Anne’s eldest son, Benjamin, who had been born in January 1709 and educated at Eton College, England, was the High Sheriff of County Carlow in 1736, M.P. for Knocktopher in 1741 and for Carlow in 1761. He was also Commissioner of the Revenue and Privy Councilor for Ireland. In 1734 he married Lady Anne Ponsonby, the daughter of Brabazon Ponsonby, the first Earl of Bessborough. Their eldest son, Benjamin, who was High Sheriff for County Carlow in 1760, M.P. for Co. Sligo in 1757 and for Boyle in 1761, died unmarried in 1763. After his father’s death, Benjamin’s younger brother, William Henry, who had married Mary Aston in 1765, succeeded to the estates. He in turn was succeeded in 1818 by his eldest son, Benjamin, who had married Anne Mainwaring. Their son, William Fitzwilliam Burton, who was a Justice of the Peace and High Sheriff of Carlow in 1822, married Mary Power, the daughter of Sir John Power, 1st Baronet of Kilfane, County Tipperary, in 1825. William’s second son, John Power Burton, married Adelaide Harriett Close, the daughter of Henry Samuel Close Esq of Newtown Park, Co. Dublin, and his wife, Jane née Waring, the daughter of The Very Rev. Holt Waring of Waringstown, Dean of Dromore, in Kingstown in 1861. John and Adelaide had four sons, the eldest, John Henry, who was born in 1862 died in 1940; of the others, Algernon died in 1932, Arthur Power in 1941 and Percy Charles, unmarried, at Altidore Castle, Delgany, County Wicklow, in 1947, aged 79. Burton Hall Stillorgan (q.v.) was bought in 1863 by Henry Guinness and remained in the family until 1945.